Further afield (London to be precise) rhubarb tends to be a key fixture in small plates menus and elaborate cocktails aplenty come spring time. And quite understandably - their deep red colour and robust flavour makes them the perfect kitchen accompaniment. 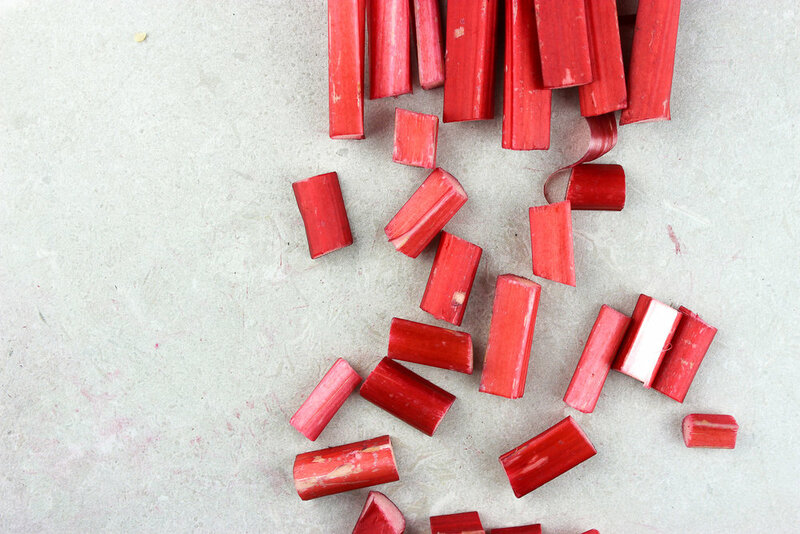 - Rhubarb has to be stewed (8-10mins), poached (8-10mins) or roasted (20mins) before use, usually with added sweetener such as honey, maple syrup or dried fruit. It's regularly mixed with cinnamon or ginger too (which we highly recommend). - Roast rhubarb can also be baked into cakes, muffins and breads. Simply add the roasted stalks to the top of the batter before baking - much tastier and easier than adding icing! - Rhubarb with savoury? Totally a thing. Slow roasted meats are great roasted alongside rhubarb, or marinated in it beforehand, adding a slightly sweet flavour. For example, try adding chopped rhubarb to the baking tray alongside a rack of lamb - it will caramelise and add a delicious sweet element to a traditional lamb roast. - Rhubarb is also a dreamy flavour for homemade kombucha, shrubs and tonics too. There's a ton of recipes on how to do this such as this super helpful Food52 guide, but our two fridge staples for summer evenings are a rhubarb and basil drinking vinegar and rhubarb and blood orange syrup (the key to perfect cocktails).